Strong winds blowing through a gap in the rocky mountains could generate electricity in Wyoming. And customers in California want to buy it. But wind power's a hard sell in Wyoming, where coal is still king. A state with an economy built on coal - has a chance to develop a green resource. As part of PRI's The World "50 States" project, reporter Jason Margolis has more. Solar Now Third Most Generated Renewable Energy In The U.S. Solar generation surpassed biomass in 2017 to become the third most generated renewable resource in the U.S., according to a new report from the U.S. Energy Information Administration. It still lags behind wind and hydropower. It’s the third of four weeks in the 2018 budget session. With the current revenue crunch, many bills have revolved around spurring new revenue, finding new sources, or cutting back on spending. And for energy, it’s no different. The surviving bills also come down to money. Thirteen bills arose related to energy, with only three still moving through the system. There are others that relate, but are not directly tied to energy. Driving west across Wyoming, there are windmills lined up across bluffs in the distance. Oil and gas rigs dot both sides of the highway. Open-pit coal mines too. What you won’t see on a cross-state trip are any fields of solar panels. In Sweetwater County, that could soon change. 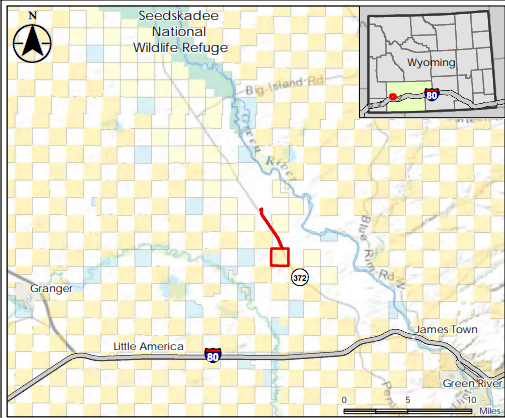 A potential solar energy project in southwest Wyoming obtained a permit last week moving it a step closer to construction. The Sweetwater Solar Energy Project, to be located near Green River, would be the largest the state’s ever seen, providing 80 megawatts of generating capacity to the electrical grid. That’s enough to power almost 12,000 homes each year, according to a project description given to the Bureau of Land Management.